Holland Taylor is a famous actress as well as a playwright in the Hollywood film industry who is also a proud winner of a Primetime Emmy Awards in 1999. Her two top-notch films are said to be The Prince and the comedy series Two and A Half Men. The famed actress has also featured in several Broadway and Off-Broadway shows during the early days of her career. Pertaining to her personal life, Holland is a strong supporter of the LGBT as she herself is a lesbian and her partner is the popular actress Sarah Paulson. Get the full details of Holland’s bio, net worth and relationship with Sarah Paulson below. The famed Hollywood actress is a native of Philadelphia, Pennsylvania where she was born on January 14, 1943. Her mother, Virginia, was a painter by profession while her father, C. Tracy Taylor, was a lawyer. Hollan Taylor is the last of three children; her two older sisters are Patricia and Pamela. 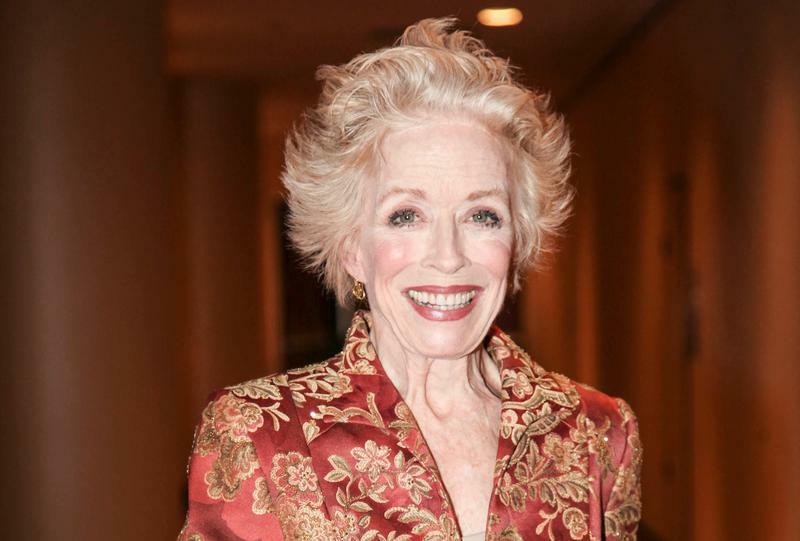 Holland Taylor went to Westtown School, a boarding school located in Pennsylvania and upon completion of her high school education she got enrolled in Bennington College where she read Drama. After college, Holland relocated to New York City in order to pursue her dreams of becoming an actress and she started off appearing in several Broadway productions during the 1960s and 1970s in shows like Butley and The Cocktail Hour. Soap Opera lovers would remember her pretty face as Denis Cavanaugh who committed suicide to implicate her husband in The Edge of Night. Her debut film was the 1976 movie The Next Man in which she was cast as a TV presenter. As her fame coninued to spread via her small roles throughout the 80’s and 90’s, Hollanda Taylor became a high flyer from 2000 onwards. The gracious actress has had various movie roles over the years which include being a Harvard Law Professor in the film Legally Blonde that featured Reese Witherspoon as the lead character. Holland Taylor has also portrayed the role of Tina Fey‘s mum in the film Baby Mama. Some other films credited to this veteran actress include The Truman Show, Happy Accidents, Next Stop Wonderland, How to Make an American Quilt, Romancing the Stone, and One Fine Day. Holland Taylor is a proud winner of the 199 Emmy Award for Outstanding Supporting Actress in a Drama Series for her role in The Practice and her decades of active presence in the film industry has attracted several nominations. Some of them include the 2000 Emmy Award for Outstanding Supporting Actress in a Drama Series for the sitcom The Practice as well as the Emmy Award for Outstanding Guest Actress in a Comedy Series that same year for The Lot. In 2005, 2007, 2008 and 2010, she got nominated for an Emmy Award for Outstanding Supporting Actress in a Comedy Series for the film Two and The Half Men. Holland is also a nominee of Tony Awards for Best Actress in a play for her work Ann in 2013. Holland Taylor who lives a very lavish lifestyle is known to have an impressive net worth estimated to be $18 million which she had worked hard to build via her career as an actress over the decades in the film industry. Is Sarah Paulson Her Partner, Girlfriend Or Husband? Back in November 2015, sources have it that Holland attended a radio interview during which she answered plainly that she was dating a young lady as well as revealing the fact that she had always had love interests in women. However, she did not reveal the identity of her partner but sources later found out that the Holland’s young love interest was no other than the pretty actress Sarah Paulson. Though the pair is not yet married they have publicly accepted their relationship since March 2016. Taylor even revealed that they hooked up officially after Sarah’s tweet to her when she was upset about something online. Holland and Sarah are both focused on their career at the moment and when asked about bringing in children into the picture, Sarah revealed she is not inclined to that as they would disrupt her career progress. She also shared a profound admiration for her partner and it won’t be wrong to say she looks up to her careerwise.